Gregory Cornelius Jones, Jr., known as Junebug to his family, just moved to Johnsonville, Mississippi, from Chicago. 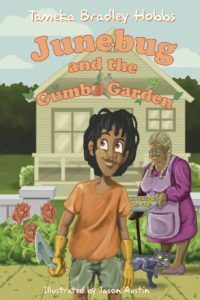 Among his new friends is Miss Marguerite Gautier, who makes Junebug the best treats – teacakes, beignets, custards – in exchange his assistance in her gumbo garden. As the crop grows, so does the mystery surrounding Miss Gautier. Junebug’s friends warn him he only discovers the truth when it is too late. “Junebug and Miss Gautier’s Gumbo Garden” calls up the language and foodways of Louisiana. The gullible Junebug, led by his appetite for Miss Gautier’s goodies, can’t bring himself to believe that the woman who reminds him so much of his Grandma Pearl, who he left behind in Chicago, could be up to no good. 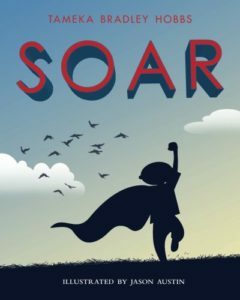 SOAR is the warm and brightly-illustrated tale of love, loss, and faith. Josiah and his Grandma Celeste share a special bond that knows no bounds. One day, she gives Josiah a cape that allows him to SOAR anyplace he wants to go. When tragedy strikes, Josiah learns his cape is a link which keeps the unbreakable bond with Grandma Celeste alive. An inspiring story with a positive message that is sure to uplift all readers. Published in August 2015 by the University Press of Florida. Florida is frequently viewed as an atypical southern state—more progressive and culturally diverse—but, when examined in proportion to the number of African American residents, it suffered more lynchings than any of its Deep South neighbors during the Jim Crow era. 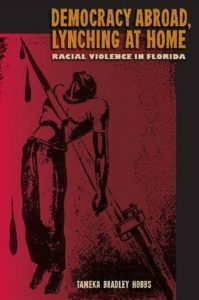 Investigating this dark period of the state’s history and focusing on a rash of anti-black violence that took place during the 1940s, Tameka Hobbs explores the reasons why lynchings continued in Florida when they were starting to wane elsewhere. She contextualizes the murders within the era of World War II, contrasting the desire of the United States to broadcast the benefits of its democracy abroad while at home it struggled to provide legal protection to its African American citizens. As involvement in the global war deepened and rhetoric against Axis powers heightened, the nation’s leaders became increasingly aware of the blemish left by extralegal violence on America’s reputation. Ultimately, Hobbs argues, the international implications of these four murders, along with other antiblack violence around the nation, increased pressure not only on public officials in Florida to protect the civil rights of African Americans in the state but also on the federal government to become more active in prosecuting racial violence. A project sponsored by Florida Humanities Council contains oral histories documenting the history of African Americans and their experiences during the 1940′s-60′s in the segregated counties of Suwannee, Jefferson, Gadsden, and Madison. By Tameka Bradley Hobbs, Ph.D. and William Guzmán. Provides a brief description of the people and places that contributed to the rich cultural legacy of the city of Tallahassee. The Library of Virginia is the oldest cultural institution in the state and the official archive (a place where history is kept) and library of the Commonwealth. In the book To Collect, Protect, and Serve: Behind the Scenes at the Library of Virginia, Archie the Archivist, Libby the Librarian, and Connie the Conservator guide young readers through a visit to the Library of Virginia. The book lets children explore some of the Library’s most important holdings—an early copy of the Declaration of Independence, the Statute of Religious Freedom, and documents connected to famous Virginians like George Washington, Thomas Jefferson, George Mason, and Edgar Allan Poe. They will learn how archivists, librarians, and conservators battle against the threats to historical documents like the Archival Enemies – Mildred Mold, Bartholomew B. Bug, and Liquid Lenny—to keep Virginia’s history safe for the future.